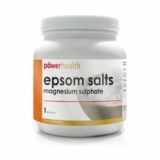 Epsom Salts Diet/Health, is the informal name for magnesium sulphate. It has long been used as an external treatment for health and beauty reasons. Epsom salt eases muscle aches, softens skin and can even soothe sunburn. Epsom salt is not suitable for consumption, working by having the active ingredient absorb through the skin. Adding a cupful or two of Epsom salt to a foot bath or standard tub soothes muscle aches and bruises, colds and flu, and itching. Epsom salts can also be used for beauty purposes, easily added to conditioner to volumise hair or in a scrub to exfoliate dry skin. Michael, a keen runner, had heard of the benefits of Epsom salts, but thought that it was old-fashioned and no long the ‘done’ thing. He volunteered to try out the product and see if it helped his recovery after long road races – he had a 10-kilometre run coming up and wanted to see if the salts would help him in any way. He ran a hot – but not excessively so – bath and added two cups full of Epsom salts, stirring them around until they had all dissolved. He climbed into the bath and stayed in the water for no longer than twelve minutes, as per the instructions. When he got out of the bath, he felt, to use his own words, ‘quite weak and peculiar’. He was left quite drained and tired by the bath, and was worried that the training run he had planned for the next morning would not be able to go ahead. However, a little internet research soon told him that the ‘peculiar’ feeling was actually ‘relaxation’! A good meal and solid eight hours’ sleep saw him feeling great, and he had a good run before work. After his competitive 10k, Michael suffered the usual aches and pains. He ran another Epsom salt bath, and found that the pain was immediately greatly eased and that overall recovery was quicker. He says he will continue to use Epsom salts periodically, especially after hard runs, but probably not at any other time. Despite being good for the body, Epsom salts should not be consumed, they are for external use only. 0%.